Desjardins Outfitting started offering Manitoba Bear Hunts in 1994 and throughout the years we have had many record book bears harvested. Alexis Desjardins is a long time member of the Manitoba Lodge and Outfitters Association and has many years of experience guiding & hunting black bear, deer, moose, elk and fishing throughout Manitoba. Through the years he has gained an extensive knowledge of the bears seasonal patterns, living and eating habits. The area that we hunt is located on the Northeast side of Riding Mountain National Park. This area is known worldwide for its tremendous trophy potential and also for the high percentage of color phase bears that it produces. It also has one of the highest Black Bear densities in North America. Here you can hunt with your choice of rifle, bow, or black powder. We also have fishing close by. Both spring and fall bear hunts are conducted mostly on private farms along the border of Riding Mountain National Park. Hunting is not allowed in the park. The bears come out of the park to feed in the agricultural fields. The baits are located along the bears travel routes where the forest meets the farmland. Most of these bears have never seen a human before. You will be hunting out of comfortable ladder stands 10' to 16' high and 15 to 25 yards from the bait. Stands are placed with the wind direction in mind and set up for both gun and bow hunters. The baits are a short 15 to 30 minute drive from where you will be staying. All of the baits you will be hunting are active and most will have multiple bears hitting them. 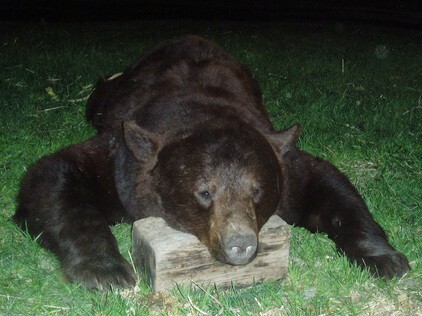 Our hunters also take a very high percentage of color phase bears each year. In the past 15 years our hunters have had a 100% shot opportunity and a 95% kill rate. Spring hunts start at the beginning of May. Fall hunts start at the end of August. ​Hunters fly into Winnipeg and rent a car. They then drive to Alexis & April's farm. Then we will bring you to our out-camp to get settled in. (Cell Service Available) Hunters will eat breakfast on their own. We serve you a big home style dinner early in the afternoon before you go out and then lunch when you return in the evening after your hunt.